The Rosemount Development Trust, on behalf of the wider Royston Strategy Group of local partners, appointed a team led by Kevin Murray Associates with Willie Miller Urban Design and Benton-Scott Simmons to prepare a comprehensive vision and strategy for Royston as a place, integrating the social, economic and environmental elements. This strategy is to be used as an advocacy tool for discussions with stakeholders, policymakers and funders, helping to sustain positive change and investment in Royston. Royston, historically a canalside industrial community known as Garngad, is located in the north-east of Glasgow, dislocated from the nearby city centre by the M8, and earlier the Monklands Canal that preceded it for nearly 200 years. It sits on the edge of the North Glasgow Priority Area, exhibiting indicators of multiple deprivation, notably poor health, lower than average levels of educational attainment and high unemployment. A great deal of valuable work by local housing associations and the community over the last twenty five years has resulted in a much improved housing stock, but there are still pockets of land that are disused or misused. The quality of place could be further improved, while the retail offer is very limited, particularly in terms of fresh food, and there are few major employers in the area. There are generally poor transport links to the rest of the city. Crucially, the Royston Vision and Strategy has been a true community-led initiative, commissioned by and developed with, the people who live and work there. The Royston Strategy Group is an important umbrella partnership including the Rosemount Development Trust, Royston Youth Action, Blochairn Housing Association, Copperworks Housing Co-operative, Royston Corridor Homes (GHA), Spire View Housing Association, the Council and local politicians. They have helped to enable a true grass roots vision, with local voices highlighting the issues and ideas, making it a more authoritative tool for building on the positive change that has taken place, by expressing the future shared direction for the area. 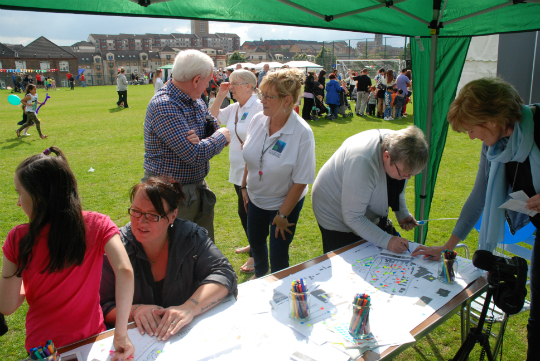 The vision aims to continue making Royston into a strong, stable, socially resilient and healthy Glasgow neighbourhood. The strategy and action plan identifies projects that have been considered under the outcomes of improving the health, economy, connectivity, social resilience and community facilities of Royston. Following discussions with the community and local organisations, the action plan also identifies some early projects that could act as demonstrators, building confidence in the process and gaining more involvement from the community. These projects offer a way of making physical differences in quick, easy ways, delivering on the momentum that the engagement process has developed. The Vision and Strategy is being used as a basis for promoting the area internally and externally, linking it to the wider regeneration of North Glasgow, connecting it to other initiatives like Sighthill TRA, rail strategy investment, stalled spaces and public art, ensuring that a whole range of diverse initiatives join together to impact positively on everyday life.